Info From The Taping Of The "Elvis Comeback Special" In LA: Adam Lambert Sings "Blue Suede Shoes" To A "Standing O"
Info From A Fan At The "Elvis Comeback Special" Taping In LA (10-11-18): Adam Lambert Sings "Blue Suede Shoes" to a standing ovation! 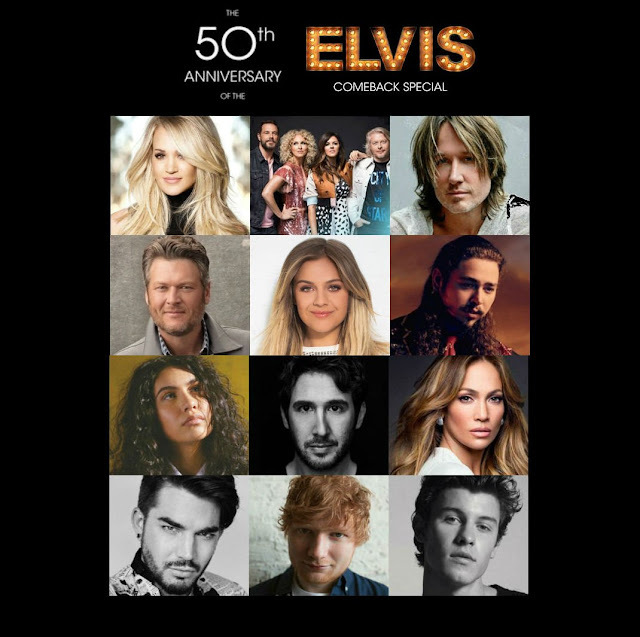 The 50th Anniversary "Elvis Comeback Special" will reportedly air on January 9th, 2019 (probably on NBC TV)..
See the tweets below from a fan @iMJulianM6 who attended the tapings, both nights (Adam was on night #2) and provided us with some tidbits, including the song he performed, to a standing ovation (he was only one of 3 of the performers who got a standing O)! We're also including an IG story from Adam and photos of Lisa Marie Presley who attended the tapings. I’m at the Elvis taping... about to go into the studio! An Instagram Video posted by Adam Lambert: no doubt from the rehearsal for the event (he reportely wore actual blue suede shoes for the taped performance). Whoopeeee! Perfect song for Adam. He looks great in blue. It's his best color, along with black. And this song is very upbeat. Gives him a chance to do a little Elvis-y stuff, just so that people know he CAN do it! And the song is a classic rock 'n roll delight. Nice to hear that he was one of only three performers to get a standing ovation! I'm sure he nailed it. He's got the attitude, the look, and Lord know he has the pipes! Can't wait to see this. Hi Mirela, thanks we actually already posted his tweet and photo of Adam on the blog in another thread. Love his comments about Adam! PHOTO: Adam Lambert From "The Elvis Comeback Special": Adam Lambert is"..one of the most thrilling rock vocalists anywhere.."
Glitzylady...Hahaha, what a relief, he won't wear those jeans. The pictures posted here don't show his pants and in the Instagram video of his foot, you can see one pant leg torn at the knee. Lol. Thanks for clearing this up. Sunflower...you're not the only one relieved that Adam is not wearing holey jeans for that performance! Whew! Saw the blue suit...yes, very sharp. I'm sure Adam will blow it out of the ballpark with his performance...so glad he's doing it.